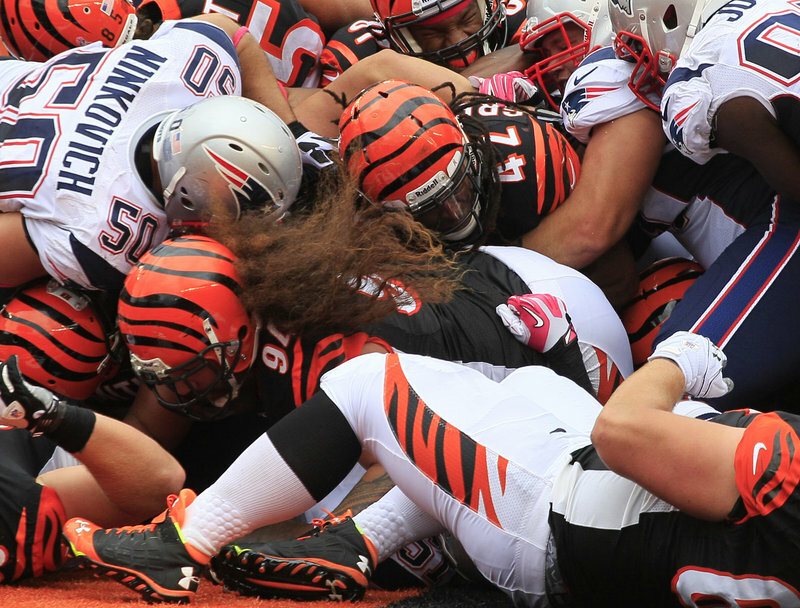 A perfect record and the QB's touchdown-pass streak are washed away at Paul Brown Stadium. CINCINNATI – Tom Brady’s touchdown streak was done. So was New England’s perfect start. 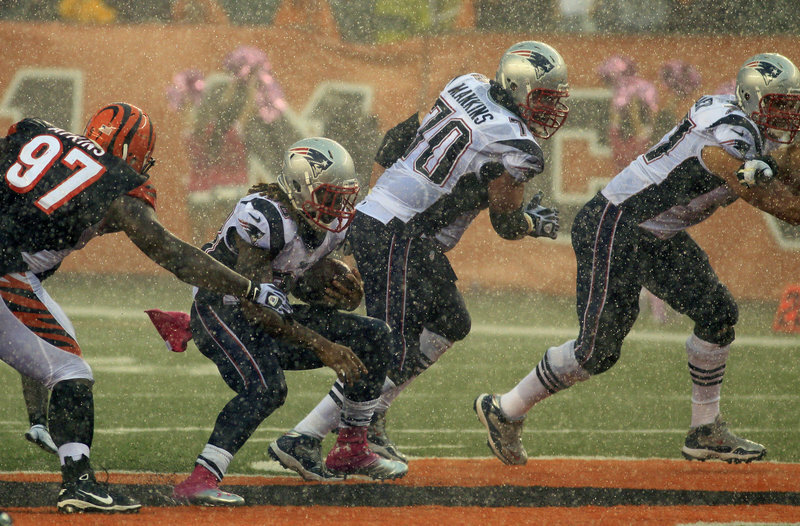 Brandon Bolden has a hard time gaining traction on a fourth-quarter run in the pouring rain against a tenacious Cincinnati defense Sunday. Former Patriot BenJarvus Green-Ellis crosses the goal line for the only touchdown in Cincinnati’s 13-6 win at home against New England. After figuring out ways to get by with a depleted roster for the first four weeks of the season, the Patriots ran into a defense that’s gotten a reputation for taking down the best. And Brady had no solutions this time. The Bengals ended Brady’s streak of 52 consecutive games with a touchdown pass on Sunday, sacking him on his first pass attempt and keeping the pressure going in a 13-6 victory over previously unbeaten New England. “It was just a poor performance all around,” Brady said. And that wasn’t all: New England (4-1) failed to get into the end zone after a first-and-goal from the 1-yard line in the fourth quarter. One yard too much for New England? Stunning. A driving rain moved in just before New England’s final chance. After a couple of dropped passes, Brady threw one toward the goal line and Adam “Pacman” Jones made a juggling interception inside the Cincinnati 5-yard line. Some finish, one that didn’t go down very well with a team accustomed to pulling them out at the end. Brady had thrown a touchdown pass in 52 straight games, second-longest streak in NFL history behind Drew Brees’ 54-game streak. The Patriots were held out of the end zone for the first time since a 16-9 loss to the Jets on Sept. 20, 2009. The Patriots couldn’t get into the end zone against a defense that’s becoming known for taking down the league’s top quarterbacks. Two weeks earlier at Paul Brown Stadium, the Bengals’ defense stymied Aaron Rodgers in a 34-30 win over Green Bay, overcoming four turnovers by Cincinnati’s offense that gave the Packers good field position. Brady never got into a rhythm against Cincinnati’s unrelenting pass rush. He finished 18 of 38 for 197 yards with one interception and a paltry passer rating of 52.2. It didn’t help that a storm moved in just before the start of New England’s final drive. Cincinnati’s defense even had a hand — well, a shoulder — in the winning touchdown. The Bengals had failed to score a touchdown during a 17-6 loss at Cleveland, one that left them looking to establish an identity on offense by running the ball. They did what they wanted in one grinding drive. It was the first time during his three-year career that Dalton threw an interception on a play that started inside the opponent’s 20-yard line. “They’re playing unbelievable,” Dalton said. NOTES: Patriots TE Rob Gronkowski was inactive for the fifth time. He’s recovering from a forearm injury and back surgery. 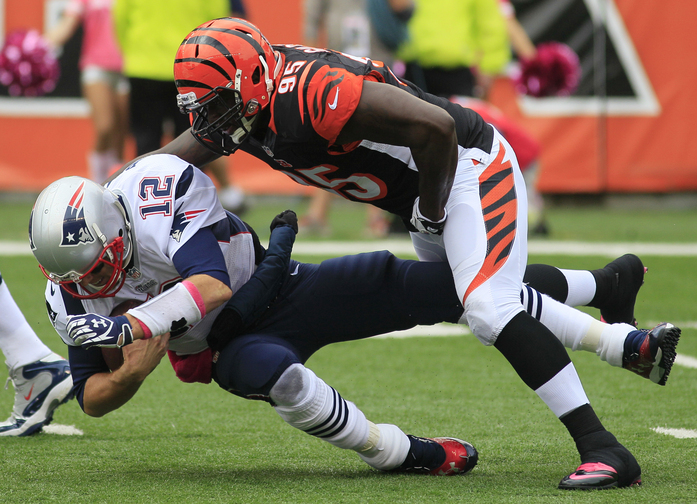 … Brady had been 4-0 against the Bengals with a 114 passer rating. … WR Austin Collie, signed on Thursday, also was inactive. … DL Tommy Kelly hurt his right knee in the fourth quarter but walked off the field.